The political season in the USA is well and truly upon us. No matter where you fall with the current candidates, I think most women in America will appreciate this little look into the past. 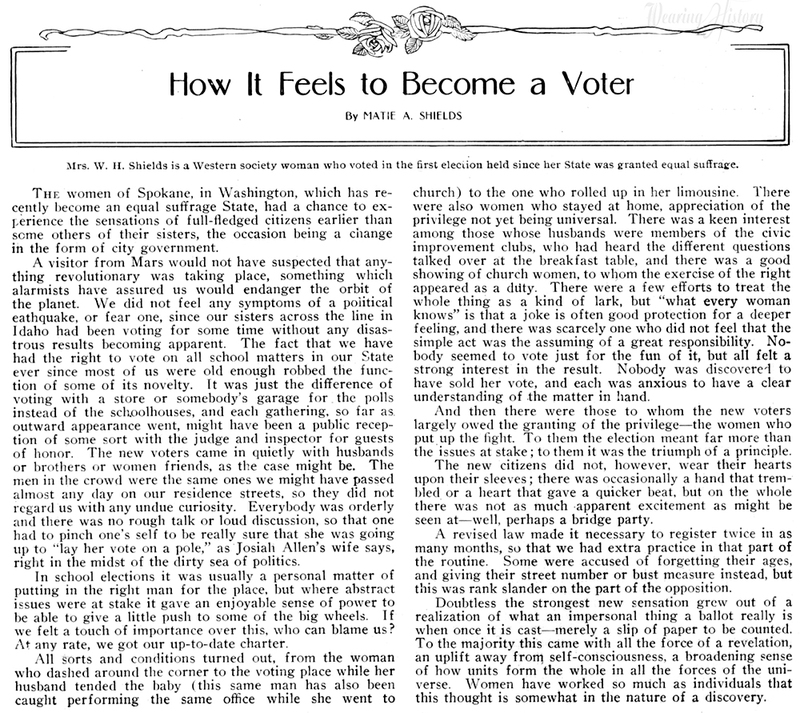 This article is from McCall’s Magazine, May 1911, and it tells the observations made by woman in a Washington state who cast her vote for the first time. Click the image for a larger, easier to read version. I find it interesting that the article states “… there were those who stayed at home, appreciation of the privilege not yet being universal.” In my mind, probably because of the influence of modern movies, etc, I picture throngs of women all eager to cast their vote for the first time. It just goes to show that no matter the time, political feelings are never universal. I’m nearly certain that some of the mock criticisms said here are said tounge-in-cheek, and were likely a reference to thing said by those who were against women getting the right to vote. Wishing you much peace and love during this political season.